Add a bit of Star Wars class to your work-a-day suit or evening wear! Features R2-D2 and the Rebel Alliance symbol. You'll love the look of these Star Wars R2-D2 3-D Palladium Cufflinks! 3-D R2-D2 cufflinks! What could be cooler than that? These R2-D2 3-D Palladium Cufflinks enable the galaxy's favorite droid to add a bit of Star Wars class to your work-a-day suit or evening wear. Let him! Luke Skywalker would have worn these as he searched for his beloved little R2 in the desert, and he would expect no less from you. 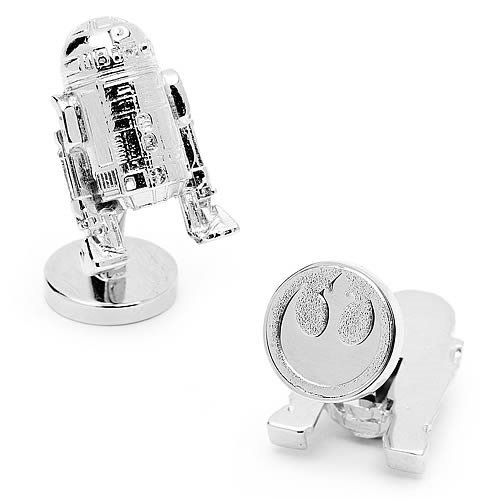 What makes these cufflinks particularly cool is that they couple an awesome 3-dimensional sculpt of R2-D2 with a backing piece that shows the Rebel Alliance symbol. Buy them to wear or to add to your Star Wars collection. Either way, you're gonna love the classy look of these 3/4-inch tall Star Wars R2-D2 3-D Palladium Cufflinks!